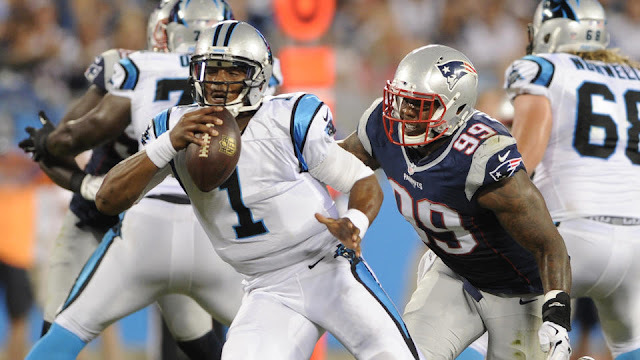 The Patriots squeaked out a 17-16 win over the Carolina Panthers Friday night down in Charlotte, with plenty of players putting in some great performances, and others not so much. With starters on both sides getting a whole half of football to do their thing, there was plenty of opportunity for the #1's to make an impression heading into the final weeks of the preseason. In the second half, the 2's and 3's fighting for jobs had 30 minutes of their own to show that they can hang on through the incoming wave of roster cuts. #99 put on a show by dominating the interior of the Panther offensive line and causing all kinds of havoc. Easley exploded through the line to drop Jonathan Stewart for a four-yard loss on Carolina's opening play of the second quarter and sacked Cam Newton on 2nd and 20 for a 12-yard loss later in the drive. He added another tackle for a loss and another QB hit. Seeing his first game action since last season, Mayo was back to his old self anchoring the middle of the linebacker core. Mayo finished with four total tackles, with two of them coming on Carolina's opening drive, first on third down and then on fourth when he combined with Alan Branch and then Jamie Collins to stuff Stewart on runs up the middle. Brown got the start opposite Malcolm Butler and played rather well in his time, breaking up two passes and chipping in on the run game. Getting the start is a great sign moving forward that head coach Bill Belichick is leaning towards tabbing him as the man heading into Week 1. Lewis again made plays when called up, building on his performance in New Orleans against the Saints. Lewis carried the ball three times for 12 yards and caught four balls for 20 yards and a touchdown, with the TD catch proving to be an incredible athletic feat from the undersized back. Cutting across the field, Lewis ran between the coverage, jumped up and went back across his body to catch Jimmy Garoppolo's pass, all before getting crunched in the back. Seeing his first game action this preseason, Chandler caught three balls for 40 total yards, highlighted by his 18-yard touchdown grab off a lofted pass from TB12 down the sideline. If other teams had trouble matching up with Rob Gronkowski before, that task is multiplied with Chandler's 6-foot-7, 260-pound presence also on the field. Dobson caught two balls for 51 yards but was to blame for both of Tom Brady's interceptions on back-to-back possessions in the first half. Brady's first INT hit Dobson in his hands before Charles Tillman wrestled it out of his hands as they hit the ground, and on the second, Dobson didn't cut into the middle of the field hard enough, instead fading back out of his turn and allowing the safety to step up and pick it off. That's the type of precision Brady demands and operates with on the field and Dobson was unable to make a tangible impact with the first unit. Not only did Brown start ahead of Ryan at right corner, Ryan also saw plenty of time in the second half of the game, which isn't a great sign. To his credit, Ryan did tally a PBU and picked up a pair of tackles, but the fact that he was playing with the backups shows he's all but lost his grip on a starting job. After getting the start at left guard, Mason was benched in favor of Josh Kline at the position. The line is in flux at the moment, but much of that will be remedied when center Bryan Stork returns. However, the two men who'll be flanking him is still unknown at this point, and Mason struggled against the first-unit of the Panthers. It was a mixed-bag for Butler on the night, as he was beaten on a handful of plays, including what would've been a sure touchdown had not receiver Corey Brown dropped Newton's pass. An illegal contact penalty wiped out a James Morris sack a few plays before the drop. However, Butler did record a PBU late in the first quarter and then stuck to his coverage on the next play on 3rd-and-10 to force the incompletion. GASP. BRADY? Yes, Brady. TB12 and the Pats offense went 3-and-out four times and turned it over twice in their first six possessions. Brady was misfiring on his throws and ran one too many times on the horrendous Bank of America Stadium turf for our liking. It took until the final drive of the first half for the team to unlock the handcuffs and move the ball, but when it finally did it was a sight to see, especially the TD toss to Chandler. Brady himself would criticize his play this preseason more than anyone, and for good reason. But, it's important to remember Brady's been playing without his three favorite targets in Rob Gronkowski, Julian Edelman, Brandon LaFell, never mind that he's been playing in front a patchwork offensive line. The backups will have one more game to stake their claim, Thursday against the Giants. After that, it all starts for real.